I talked to a fascinating event in Endhoven on Friday. There was an associcated and rather good show at an art gallery in town (featuring James Bridle) and they asked me to write something about 'Post Digital' for it. I wasn't keen really, I'm a bit fed up with Post Digital. But I was flattered to be asked to write something for the art world and it felt like I might be supporting James a bit so I did it. It does't actually seem to have been published anywhere though, so I thought I'd stick it here. There's not a lot of new news about it, but it's here for completeness. 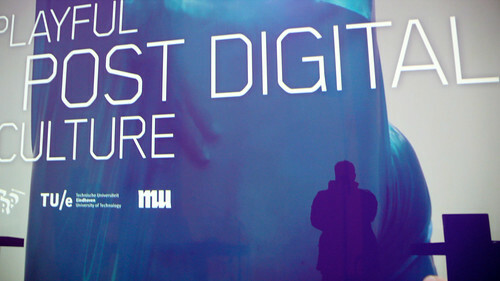 I first talked about Post Digital at an event called Thinking Digital in 2009 in Gateshead. Looking back that’s probably where the phrase came from. I imagine I was trying to make a point that it was already too late to be merely Thinking Digital and we had to try and get beyond that kind of trammelled and limiting mindset. That’s the kind of arse I am. The first was really an accident. The second was a desperate search for some sort of rationale that would make the first seem less stupid. The third is just characteristic of a short attention span. Watching the paper being printed, feeling the rumble of the machines, we became slightly obsessed with the idea of putting all this in a browser, wiring it all up to the internet, making it into another web accessible resource. Of not seeing the web as a way of floating off the physical world, disappearing in a puff of bits but embedding the web in the world, using it to reclaim, reuse and re-appropriate industrial age technologies. We became interested in the idea that we didn’t have to invent new ecosystems for everything that needed doing, that there were all these magnificent infrastructures just lying around, waiting to have new life breathed into them. They were being abandoned by the commercial entities that built them – just as they finally grasped the need to ‘get digital’ – but that didn’t mean they were valueless. We decided that Newspaper Club’s message to the newspaper business could perhaps be a rallying cry for the internet at large: We Have Broken Your Businesses, Now We Want Your Machines. We started the business because that seemed the best way to explore these things; how do you combine the best of the web – distribution, accessibility, curation – with the fastest, cheapest real-world printing? The reaction was weird, we had to keep explaining what was so good about newsprint to people who’d grown up with it. They seemed unable to divorce the technology from the business infrastructure that had built it. But it’s a great way to read, we pointed out, it’s durable, requires no batteries, the grammar and affordances are well understood, you can wave it around at a protest, it’s easy to monetise. Blah, blah, blah. All the familiar arguments. But it’s not digital they’d say, it’s not modern, you can’t update it on the fly, it’s out of date as soon as it’s printed, it’s a terrible way to deliver news. Yes, we’d say, and we’re not using it to deliver news. We’re letting people make wedding gifts, or print wrapping paper, or newsletters for their Paintballing Club or limited edition artistic monographs. It just takes digital content and makes it into something with higher resolution. Yes, er, but, they’d say. It’s still not very digital is it? And, I think that’s why I liked Post Digital. I was trying to suggest that a generation of business people and technologists should get over themselves. They were so proud of being the people that monetised the web that they couldn’t get past it, they couldn’t think about what was next. They thought they were the end of the revolution, they’d stormed the Winter Palace and they were starting to tidy up. Post Digital was a suggestion that, maybe, we needed to get over that and start thinking about the next phase, the phase where it got integrated into the world. What will we do, I was asking, when we can take all this connectivity for granted? When it’s no longer special or interesting? What will we build then? I, obviously, wasn’t talking about ‘Digital’ meaning ones and zeros, or Post Digital meaning Post Technology. I was getting at a particular cohort of technologies, attitudes and organisations. The companies that delightedly described themselves as Digital, the ones with the big screens in reception, the people that think a life well lived involves a big empty room, a really nice chair and a laptop. But it didn’t really work as a provocation. In fact, a bit later, I had to write a blog post disowning the idea. Or, rather, disowning what everyone thought I meant. A company I was working for, a traditional and resolutely analogue business decided it might like to use Post Digital as its marketing slogan. I realised then that it didn’t mean enough that was useful to me. It was just silly. Nowadays I only hear the words Post Digital when my friends want to take the piss. But, but, but…there’s still something there. There are still some thoughts worth exploring. Firstly, I’m not getting any less bored with screens. And I don’t think I’m alone in that. A generation of designers and makers has grown up with the web, but they’re starting to realise that they’ve put every single pixel in every single position and there are no new possibilities in that glowing rectangle. Yes, of course, there are magical technological moments to come - and screens will deliver most of them. Screens will get cheaper, easier to power, easier to deploy and, hopefully, less glowing and attention grabbing. But it’s increasingly hard to impress anyone with a screen, everyone’s seen everything, in movies if not in life. But making matter do interesting new stuff still excites the hell out of people. We’ve seen that with Newspaper Club; hardened journalists and experienced print workers are astonished that we can print a single copy of a newspaper – much more befuddled than they would be by a genuinely difficult technological achievement delivered through a screen. The problem right now, is that matter is hard, whereas bits are easy. You can take a new idea and push it through well-established pipes and into familiar pixels and sell it to the world. Digital scales. But even though the digital is convenient, you can feel people turning back to the real. Designers want to express themselves in new objects, they want to connect to more senses, they want to feel the grain of new materials and understand the implications of weight and friction. And, of course, capitalist and technological logic will dictate that the harder thing will soon become the desirable thing. Hard equals rare, rare equals exclusive, exclusive equals valuable. So you’re seeing people playing with arduinos, not just as hobbyists but to explore new possibilities. You’re seeing them playing with 3D printing, inventing ‘computational wood’, rediscovering sound and tactility. They’re working to extract the joy of the connectivity and intelligence from our shiney, square devices and to squeeze it into our world. I’ve decided to deem that instinct an aspect of Post Digital. Why not? It may as well be. And here’s another one: we’re not going to be living in a world of analogue ‘out here’ and digital ‘in there’. There’s not going to be analogue stuff wondering out in the world and digital stuff lurking behind screens. The digital stuff is going to be walking the earth too. We already have it embedded in our cars and washing machines and operating theatres, but we choose to ignore that, or to read it as something other than robotics. But, now, we’re starting to live with robots that look like robots, drones that look like drones. Digital is living in the real with us and it’s starting to change things, it’s starting to make what my friend Matt Jones calls a ‘Robot-Readable World’ - a world that accommodates machines as much as it accommodates us. I wrote a thing a few years ago wondering about this kind of stuff, imagining what my fellow marketing professionals would do with cheap and easy robotics if they got their hands on it. The answer popped into my head fully formed and depressing. They’d build robo-chuggers. Cute, charming robots designed to replacer the ‘chuggers’ (or charity muggers) that roam British streets looking to sign people up to Direct Debits for good causes. It seemed like one of those slightly parodic speculative things that would never come to pass but might illustrate some worrying issues. It got built last year. Only they came up with a better name – ChugBot. The robots are coming, they’re sliding into our lives via electrical goods departments and toy shops and catalogues and soon, straight from China into the Pound Shops and onto the market stalls. Yes, we’ll be getting fancy, glossy robots doing all sorts of deeply sophisticated things but mostly we’ll be getting bottom-up, cheap robotics doing stupidly amusing things. We’ll be getting robot gadgets and novelties. Snow-globes connected to the weather forecast. Coasters connected to calorie counters. This isn’t nice websites and fancy apps. This is something else. This is what comes after that. So we could call it Post Digital. Why not? Of course, the positive upside of all these cheap robotics is the same as the upside of a cheap web. We can make our own stuff. We can express ourselves. We can build what my friend Andy Huntington calls The Geocities of Things. We can add life and connectivity to the things in our lives like we were little Harry Potters. The magic and silliness of the web can escape from behind the screen and spill into the world, sweeping away the pristine banality of mass consumer electronics in a tide of walking gonks and talking doorknobs. It’ll be stupid and brutal and glorious and fun. And designers will absolutely hate it. Remember when we had to tell graphic designers that they couldn’t control how things looked online? That the lovely page they’d designed might not look like that on someone else’s computer, in someone else’s browser? Soon we’re going to have to do that with everything. Designers are going to have to design things that might or not get made with the specified materials, in the specified way, to the specified tolerances. They’re going to have to design the idea of an object and let the world make it the way it wants to. That seems Post Digital to me. I like the sound of it. Maybe it won’t take over the world, maybe it won’t be as big as the web, but I bet it gets to be as big as fishing or tabletop games. And that’d be fantastic; the imaginative, creative energy that goes into DIY and model railways and quilting getting poured into improving the stuff of everyday life and connecting it to everything else. That’s properly Post Digital. And then, this morning, when struggling to think of a good ending to this, I heard a brilliant talk by George Dyson – describing the early history of computing unearthed from correspondence between Turing and Von Neumann. And I thought I heard him cite this quote from Turing. I wasn’t quite fast enough with my pen to be 100% sure and I can’t find it on Google, but I think this is what he said. And, if it is, it’s exactly what I mean and we can leave it at that. What I think he said is this: “being digital should be more interesting than just being electronic”. I’m sure that meant something slightly different in the middle of the last century but the words are useful and simple now, they’ll do for me as a tiny rallying cry; being digital should be more interesting than just being electronic.